Let’s dye jeans! Do you have a pair in a color you hate? So… I had a pair of jeans with white-ish (not on purpose) knees… they were otherwise in great shape but the knees looked crummy and I found myself not wearing them, especially when I needed to look nicer than crummy. When it got to the point that I did not care if I ruined them, I decided to see if I could dye them back to a darker blue. I’d either improve them or trash them. I read the instructions on the iDye packet. I read them 3, 4, 5 times. There were slightly different instructions for top loading and front loading machines. And, a stove top method to use with a big pot. The instructions seemed easy but I sure didn’t like them! I’d chosen “navy”, a nice dark indigo color and, even though it said to just toss things in the washer, I really did not want that deep color anywhere near my washing machine! So, I thought I’d try the stove top method but soon realized that I had nothing big enough to hold a bulky pair of jeans, much less with room to stir them around and simmer them. Cross off that method completely! Unless you are a witch from Macbeth, nobody has a big cauldron to use on a stove! So, I devised my own method. My hot tap water is really HOT… so I decided to try a big plastic bucket instead. I placed it in my bathtub, ran the hot water, mixed the ingredients (the dye packet with a cup of salt for cotton) and mixed it with my big wooden spoon. (a teakettle of boiling water could be added, too, especially if your tap water isn’t hot enough) The instructions also say to agitate the fabric constantly to get uniform color. (important) The wooden spoon promptly turned inky indigo and the bucket turned deep blue as well. I stuffed in the jeans, (gosh! they were heavy and hard to keep stirring!) when another idea hit me! You knew something else would have to happen, didn’t you? I’d just purchased a new pair of jeans but they were orange. (you know, the only ones that were there, on that day, in that certain style, in my size, that fit and were comfortable and, hey, it was summer! and hey! the orange was really pretty!) BUT, the orange was not nearly as useful to me as a pair of nice dark blue jeans would be with autumn closing in… and I was willing to take a chance! I ran to my closet and stuffed the orange jeans into the bucket inside the bathtub with my old jeans. If the orange ones turned out ugly, then I was okay with that, I’d wear them for doing grunge-y things. If I thought one pair had been hard to stir and keep stirring, then the two pairs together was brutal, but I also hated to waste my hot water and dye concoction so I kept stirring! VICTORY! Much more than I ever imagined. My old jeans came out looking brand new and my new orange jeans came out fine and dark and perfect. I now wear both pair a lot. My only advice would be to wash a brand new pair of jeans first to remove the sizing so that they soak up even more of the dye. (sizing, which adds finish and body, works a bit like repellent, but luckily my very hot water dissolved it on the pair that were new) But, my bucket was dyed and my bathtub was, too. (I did not like that I had to really scrub them both.) But I like my results so much that I may try the washing machine method next time I get inspired to use dye. And, I found a dress. But, you know, there is always a complication! The dress was white. And you know that almost anything can be worn to a wedding but not white. No other dress turned up but there was a plan simmering in the back of my mind. I thought I might paint it, then, I decided to spatter paint it because it was a really easy thing to do. I rummaged around for a bottle of very bright green ink that I’d had kicking around for years and years. I laid out the dress on an old area rug and tested it inside the hem and, loving it!! !, spattered on the ink with a brush. When I finished the front side, I hung it to dry and then spattered the reverse the next day. Anybody notice any errors on my part yet? Any alarm bells go off? Well, remember how all instructions everywhere tell you to test a spot first? Hey! In my defense, I did that… but I didn’t let it totally dry before I proceeded. After drying, the color turned a dark, mossy green. That was actually okay by me; the new color was beautiful, and, whew! I’d dodged a bullet, because what if it had turned a color that was ugly? However, the rug beneath the dress kept the chartreuse color after it dried. Why? The ink I used reacted with the finish on the dress. If I’d washed the dress first, it probably would not have changed. However, I had an even bigger problem that I did not know about until after I was at the wedding! Here is what happened. While sitting and waiting for the ceremony to start, my hand looked a little green to me… and then I discovered that the white chair on which I was sitting turned green. The ink was rubbing off! Onto me, onto my skin, onto any and everything! I’d never read the label on my ink bottle which said “Limited lightfastness.” Again, good news… not much rubbed off and, because everyone was either more concerned about what they were wearing and how they looked or, they were captivated by the beautiful wedding and it soon got dark… it really wasn’t a fiasco. I was humbled, though. Why had I not READ the label???? 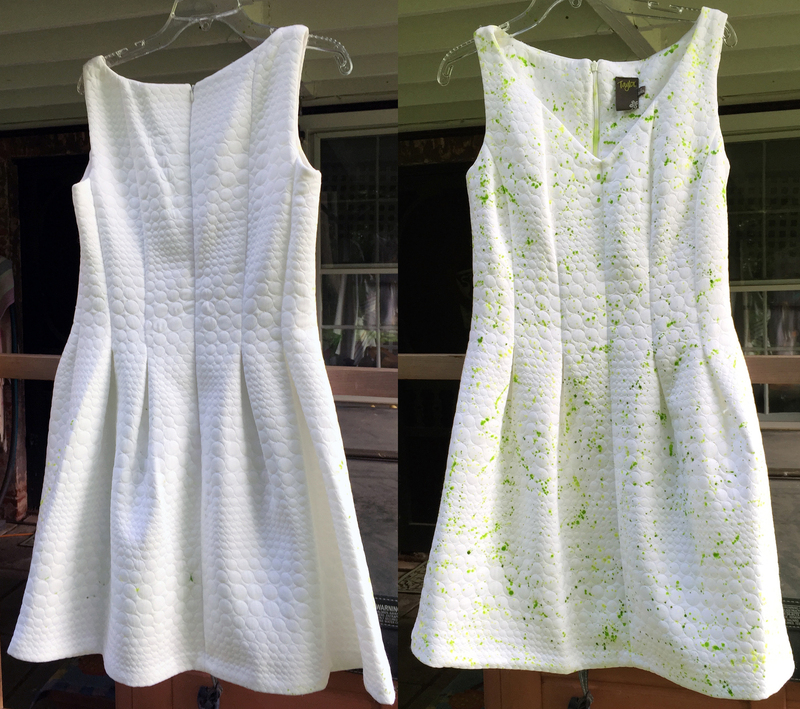 But, after all this, I am getting a second chance to re-spatter my dress and I have colorfast ink this time. 1. washing down pillows and a down jacket. 2. Washing sneakers. You have heard that some things (down pillows, down jackets, sneakers) can be washed but only with great care… I have always heard that, too, but was too worried to try. However, I finally reached the point where I did not care if I ruined them and decided to tackle some of these things. I washed the sneakers first and they came out okay, whiter but after using them in the dryer, they did seem to shrink a size; the second pair I washed were fine but a third pair did not retain their toe shape. They were a more mesh type fabric. I urge caution, especially if you have favorites. Wash in cold water and dry on very low heat. I love down pillows but when they flattened and did not seem “fresh”, I wanted a change. I did machine wash them, using hot water, mild detergent and then I ran them through an entire second cycle with just water to make sure the soap had been rinsed out. They came out of my centrifuge-type washer smashed together in brick-like form. I knew that, in order to re-fluff the down, they needed to be dried for a very long time and they needed to have something in the dryer with them that would bump the down apart. Hence, I used my sneakers and also a set of plastic dryer balls. )I also know that tennis balls should work but I didn’t have any.) I did the same thing with my down jacket. Why I was attracted to a WHITE jacket for winter is inexplicable but both the jacket and the down pillows turned out quite well. I did not and would not wash them together. The secrets are: lots of rinsing, LOW heat for a long time period, and something to knock apart the down as it is drying. Not too scary, not too bad!